Papaya Cream with Cassis is a healthy, quick, delicious, and refreshing Brazilian dessert made from blended ice cream and papaya, served with cassis (black currant liqueur). Papaya is a fruit native to Central America, but Spanish and Portuguese explorers brought it to many other tropical and subtropical lands to which they journeyed, including India, the Philippines, parts of Africa, and Brazil. Brazil presently has become one of the most important growers and exporters of papaya. The largest plantations are found in the state of Espírito Santo and in the northeast region of the country. Because of the climate of these areas, papaya can be produced, harvested, and offered to consumers year-round. The Brazilian papaya has a soft and very aromatic pulp, with colors ranging from orange to salmon, depending on the degree of ripeness. The skin is normally thin, smooth and fairly tough, sticking to the pulp, with a dark-green color that turns orange-yellow as the fruit ripens. Golden, Formosa, and Calimosa are its most common varieties. Healthy, low in calories and a rich source of vitamins, papaya is one of the most easily digested fruits. In Brazil, it is not only often consumed in its natural state, but also incorporated into ice creams, juices, fruit drinks, savory and sweet salads, smoothies, compotes (made with green papaya), and dessert creams. 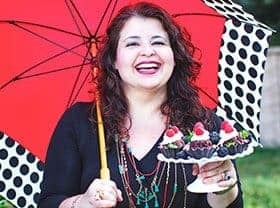 The healthy, delicious, and refreshing papaya cream with cassis liqueur (or with berry coulis) is the recipe that I have for you today, which I am a fan (as much as I am of our avocado cream)!!! A healthy, quick, and delicious dessert recipe!!! Note: If you prefer to use the coulis instead of the liqueur, make it first according the recipe below and refrigerate. 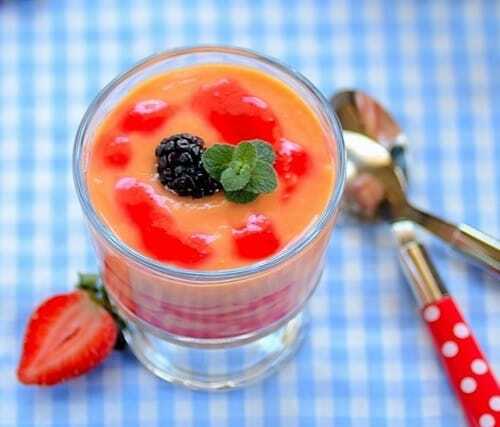 To make the papaya cream: In a blender, blend well the papaya with the ice cream until obtaining a creamy mixture. Reserve. 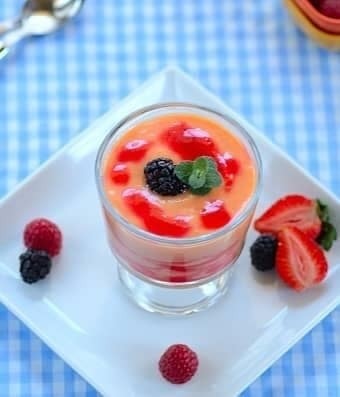 Pour 1 Tbsp cassis cream liqueur or berry coulis into each tall chilled dessert cup, swirl, and top with the papaya cream (or simply serve the plain papaya cream with berries on top). Decorate and serve immediately. To make the berry coulis: Place the berries, sugar or sugar substitute, and water into a saucepan. Bring to a boil, then simmer for 5 - 10 minutes or until the fruits are soft. Stir in the lemon juice, remove from heat, and cool slightly. Purée in a blender or food processor; then, strain through a sieve, rubbing it through with the back of a ladle or spoon. Refrigerate. Thanks a lot! I am glad that my blog helped you with the info that you needed for your project. Hi, I am an American living in Minas and have about 50 papaya trees grown from U Hawaii seed. I am always looking for new ways use it up….I can’t give it away fast enough. At the farm we make icecream all the time. .. and drink kir …so the rest of the ingredients are a cinch…. Thank you for trying this recipe. I hope you have enjoyed it! Papaya is one of my favorite fruits. I’m trying this! I made this papaya cream and enjoyed so much. A quick and satisfying dessert especially in summertime.